Perfect Accommodations after a Full Day of Hiking & Birdwatching. Located just 15 minutes from the Monteverde Cloud Forest Reserve, Monteverde Lodge and Gardens is a great place to relax and unwind after a day full of hiking, birdwatching, and enjoying other Monteverde wonder-filled adventures. The property features 24 large rooms that come with most of the standard amenities, such as the coffeemaker, safe, and hair dryer–but no TV set! Bathrooms showcase the glass-enclosed showers run on solar-heated water. 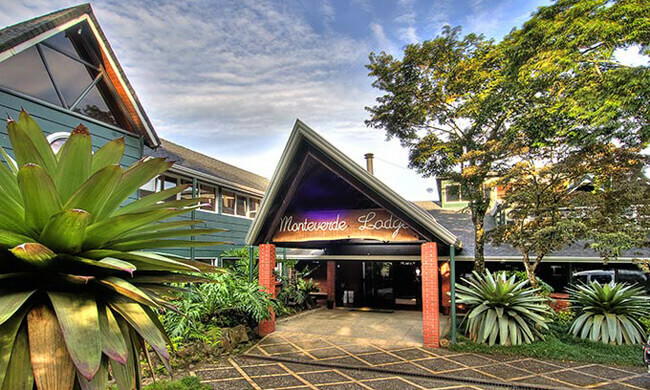 Monteverde Lodge has a cozy open fireplace next to the lobby, a restaurant with complimentary a la carte breakfast and affordable dining rates, a bar, and a 15-person hot tub. There are comfortable sofas in the bar, reading room, and on the garden terrace. If you need to stay connected, feel free to use a computer room with three computers and the complimentary wireless connection throughout the hotel. Lush tropical gardens are the pride and joy of the property. The landscaping is designed to bring the flora and fauna of the cloud forest to the hotel’s doorstep. Plan on spending a morning or afternoon wandering around the well-kept garden, featuring imperial bromeliads, the skinneri orchid, known locally as the national flower Guaria Morada, and hedges of the blue porter weed and lantana, always surrounded by butterflies.